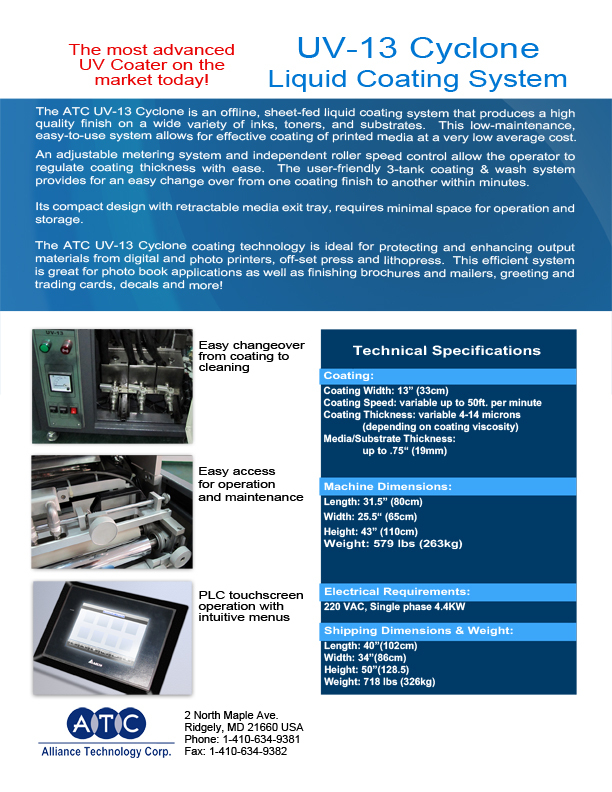 The ATC UV-13 Cyclone is an offline, sheet-fed liquid coating system that produces a high quality finish on a wide variety of inks, toners and substrates. This low-maintenance, easy-to-use system allows for effective coating of printed media at a very low average cost. An adjustable metering system and independent roller speed control allow the operator to regulate coating thickness with ease. The user-friendly 3-tank coating & wash system provides for an easy change over from one coating finish to another within minutes. Its compact design with retractable media exit tray requires minimal space for operation and storage. The ATC UV-13 Cyclone coating technology is ideal for protecting and enhancing output materials from digital and photo printers, off-set press and lithopress. 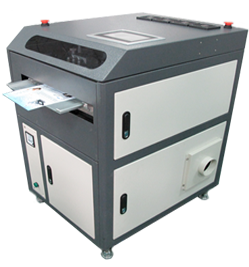 This efficient system is ideal for photo book applications as well as finishing brochures and mailers, greeting and trading cards, decals and more!